. Fits One of our favorite accessories is the 975 Engine Guard. The clean styling of this engine guard makes it the perfect accent to a custom build or a great upgrade for an otherwise stock bike.
. The 975 Engine Guard is a direct bolt-on engine guard. 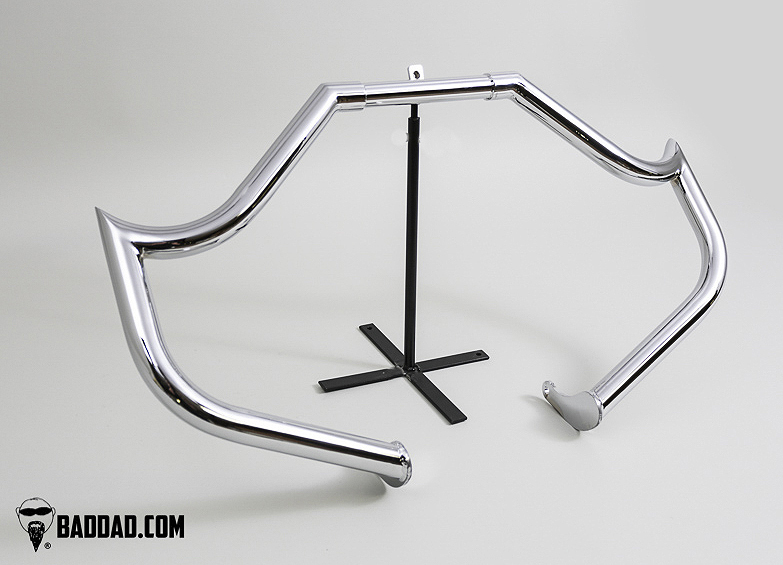 This custom bar made from 1-1/2" mandrel bent tubing and is available in gloss black or chrome finishes. The 975 Engine Guard is available for all 1997-2018 Touring models.
. The 1997-2013 Road Glide version includes a custom inner fairing support bracket. The price difference for this model includes this custom bracket.
. Clamps: This larger 1-1/2" diameter bar may require larger mounting claps if you are using highway pegs. You can use our clamps or any other clamps that work with the 1-1/2" diameter bar.
. Note: Chrome version currently unavailable at this time.